When carpets start showing wear, traffic patterns and stains, many consumers weigh the costs of using professional carpet cleaners against doing the job themselves. Cleaning your own carpet may seem like a fairly simple task, but overuse of cleaning detergents, damage to the carpet fiber tips, over-wetting and incomplete detergent removal can cause reappearing stains and yellowing carpets. Professionally-trained and certified carpet cleaners perform a multi-step process to ensure they accurately assess your carpet’s fiber type and the soiled and stained areas. They also use professional-grade equipment and cleaning solutions that achieve the best results with out compromising the carpet’s fibers. Professional carpet cleaners use one of a few different cleaning methods. Hot water or steam extraction is the most common and what most carpet fiber producers and carpet manufacturers recommend. This is the only cleaning method that works thoroughly enough to remove soil embedded deep in the rug’s pile. A fine water and detergent spray is applied to the carpet, and a powerful vacuum removes the water and soil from the carpet, leaving the fibers clean, soft and fluffy. Other cleaning methods involve carpet shampooing, “dry cleaning” with absorbent compounds sprinkled on the carpet, or carbonated cleaning. This method, also known as the bonnet method, can damage carpet fibers by leaving swirl marks and creating fuzz on the carpet’s pile. Shaw Industries, the world’s largest carpet manufacturer, recommends using only hot water or steam extraction methods to have your carpets cleaned and extend their useful life. Professional carpet cleaners pre-inspect your carpet before cleaning, taking note of areas that need special attention or pre-treatment. The service technician will note the type and construction of the carpet and advise you of any areas that could have permanent stains. Your carpet will be vacuumed thoroughly to remove dry dust and debris. This step is important, and ensures none of the dry soil turns into a stain once the steam cleaning takes place. The service technician will also move tables, chairs and sofas. Any furniture not moved will be protected with disposable plastic liners underneath each leg. The service technician, after identifying traffic areas and any spots needing pre-treatment, will apply a specific pre-spray solution to the stains. The type of solution and the amount of heat applied depend on the type of stain being removed. Next, the technician uses a hot-water extraction process to thoroughly flush the pile of your carpet with a cleaning and rinsing agent. The technician calibrates the equipment to make sure the heat and water pressure are geared to the needs of your carpet’s type and construction, avoiding over-wetting or damage. Once the carpet has gone through the extraction cleaning process, your technician will examine it for any remaining spots. Any stains not identified as permanent will be further treated with specialty spotting agents and techniques. The technician will also rake the carpet, depending on the type, to speed up the drying process and give the carpet pile an even, consistent appearance. The service technician will then ask you to survey the carpet, taking note of any issues you may have. After cleaning, we apply protect our customers’ carpets by applying Scotchguard at no additional cost. Professional-level carpet cleaning can actually slow down the deterioration of your carpet, since soil gets ground into the fibers, encouraging fraying and other damage unless it is removed. We use only state-of-the-art steam cleaning with a truck-mounted system. 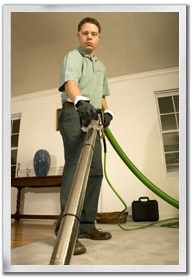 We provide spot removal, deodorizing and furniture replacement for no additional cost. Our company has received certification from the Institute of Inspection Cleaning and Restoration and our service technicians use ProChem systems to provide you the most efficient, safe and effective cleaning services. We want to be your carpet cleaner of choice in New Jersey. Call us today for a free estimate! We work hard for our customers and offer 24-hour emergency service. Customer service is our top priority, and we absolutely guarantee our results — we’re not satisfied until you’re satisfied. Contact us at www.highqualitycarpet.com to see how we can help you.